May 4th 2012 was a great day! 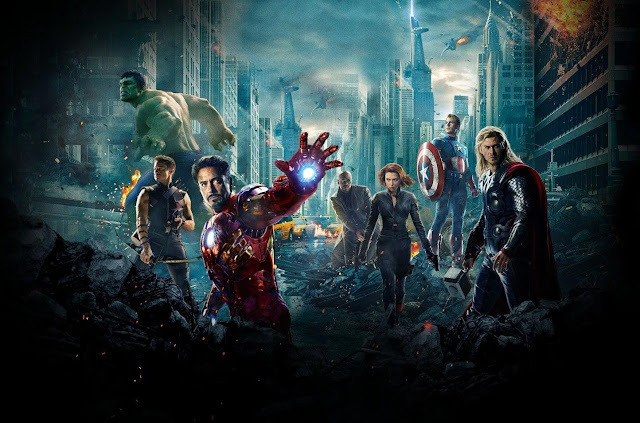 The Avengers came out in the theater. After researching the movie, we decided we were going to let our kids see the movie since they were both begging us to watch it! Yes, even my 3 year old daughter was begging to see it, she LOVES Hulk! If you ask my opinion about children seeing the movie, I would say it depends on your child. If they tend to get scared and have nightmares, it's not for them! Our kids have seen a lot of action and it doesn't affect them in that way. We also had great conversations, after watching the movie, about good and evil and about team work (because all of the Superheros, together, get more accomplished then when trying to do it alone)! One more thing, the movie is 2 1/2 hours long so you couldn't force most little kids to sit that long for a movie. My daughter fell asleep the last hour. If you are an adult and haven't seen the movie, you are missing out! I'm not that into this stuff and it kept my interest the WHOLE 2 1/2 hours! I now want to see the other movies! 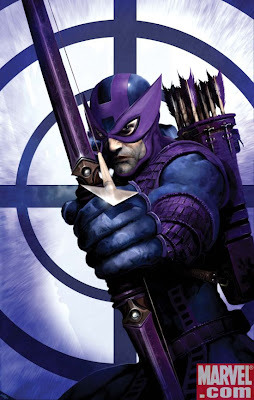 This movie introduces us to a character most don't know much about, HAWKEYE! Marvel comics drew him with a blue and purple costume but the movie has him dressed in mostly black. My son fell in love with him! After the movie, all he could talk about was shooting a bow and arrow and dressing up like Hawkeye! My husband and I had been discussing how to make a bow for Brenden just so he could pretend. So one day after my husband came home from work, he broke a small branch off our front tree and pulled all the little branches off. 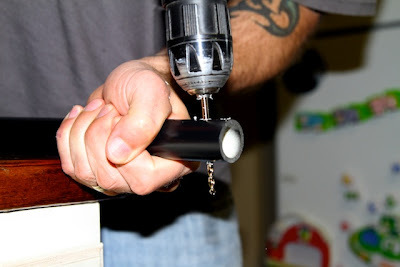 Then he got some rope and used his staple gun to attach it to each end. 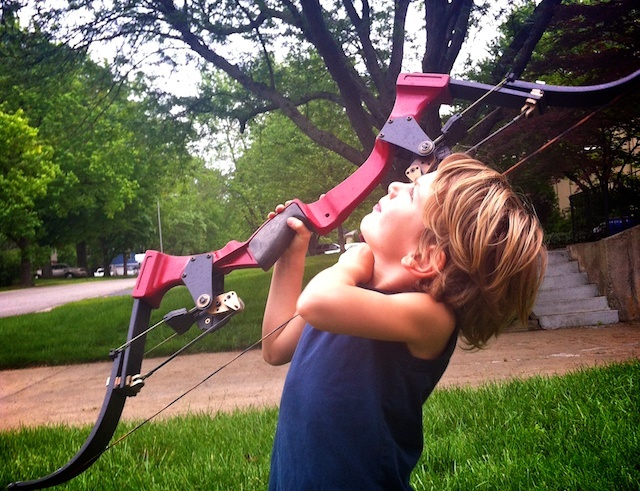 Brenden LOVED it and was playing outside, pretending to shoot arrows at bad guys. Our neighbor Chris came home and we got to talking about the Avengers movie and Bow and Arrows. He has a bunch of REAL "toys" that he brought out to show us. Most of them Brenden couldn't even pick up! As we talked, Chris had a great idea to make a Bow out of PVC pipe. After the conversation, we continued to play outside with other neighbor friends. The next thing we know, Chris comes back in a half hour with all the parts to make the bow and arrows! The first attempt with a PVC bow, we used 1/2 inch PVC pipe. We found that it was a little weak in the center and the bow ended up breaking. The instructions below are for the updated version. Which has been used and played with by many children and holds up! 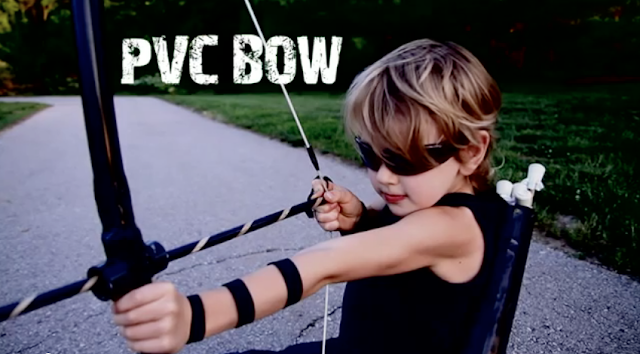 Parents and caregivers, now you finally have easy and cheap instructions to make your child a bow and arrow which REALLY works and is safe to shoot! I still recommend supervision and ALWAYS with the rule of not shooting towards people! 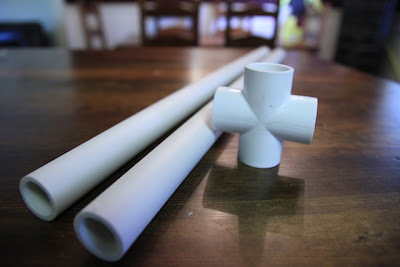 First thing you need to do is cut down your PVC pipe into two equal pieces, 2 feet long each. 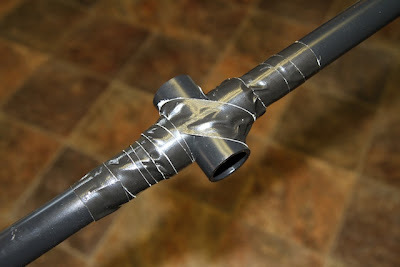 The next step is optional, if you are making a "Hawkeye" Bow, you will want to spray paint your PVC pipe and connector black. Let dry and then prime and cement together with the PVC glue. After the primer and cement dries, you can add support by taping the center with black Gorilla tape or duct tape. When you shoot the bow most of the pressure is on the center, that is why this is a good idea. It also gives the Bow a cool look! Next, drill a hole in both ends of the PVC pipe. This is where your string will be attached. For this next step you either need two people or one really strong person. To attach the string tie a knot at one end and burn the end of the rope to prevent fraying. When you are ready to tie a knot at the other end you need to bend the bow a little. You can see an example of this in the picture on the left. Chris is pretty strong so he was doing it by himself but what I suggest is one person bend the bow while the other pull the string tight and then tie a good tight knot. After the string is attached, put a little tape over your knot and extra string, as pictured on the right. We also added a little tape above and below the center of the string. This will help show your child where the arrow goes. 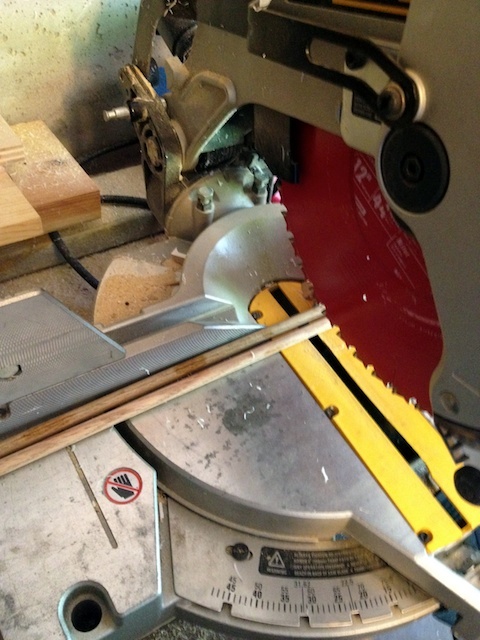 Cut the Oak Dowels in half with a chop or hand saw. The ones we got were 36 inches long, which makes the arrows about 18 inches long each! The next step is to take your rubber chair tips and attach them to one end of the dowel. We used two, 2 inch square pieces of felt and pushed the rubber tip down over the dowel with the felt in between but you could also attach it with hot glue. On the other end you want to make a notch that your string from the bow will fit into. On the video, this is what my son calls a "scratch". You can either use sandpaper or my husband used a saw blade. 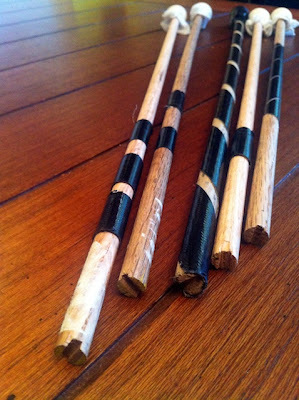 Then for decoration you can use black Gorilla tape around the dowel. Make any design you want! Now that you know how to make it, here is a fun story which goes along with this Bow and Arrow. We took it out twice yesterday to two different places because of end of school parties. Both times my son had a line of kids wanting to try and shoot it and saying things like "I've always wanted to shoot a bow and arrow!" and "Where did you buy this?" He loved showing all the kids how it works and it was fun seeing it withstand all the action of many different people, even adults, shooting it! Enjoy your Bow and Arrow and be prepared to have people ask if they can try it out! I also wanted to give a BIG shout out to my AWESOME husband for making the really cool video in the beginning. I LOVE you! What would I do without you!?! 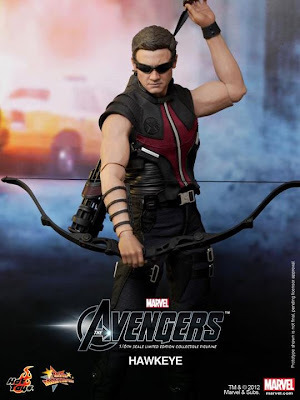 *TIP*You can find great black sunglasses for your hawkeye costume at the Dollar Store! To see the whole costume page click HERE! Nice! Can't wait to try it with Silas! Where did you get or how did you make the hand and arm accessories? That will be coming tomorrow in the part two post! It's a lot of instructions for one blog so I'm breaking it up! I thought the bow and arrow needed to be all by itself! Check back! Thanks for your interest! Thats soooo cool! Any chance of making an adult sized one? I'm 23 and soo want one right now!! Also, an idea for you: If your kids want to practice their aim, you could paint a board black and mount it somewhere, then place a dish of baby powder next to your kids. Every time they get ready to shoot dip the tip in the powder. :) I so want one of these they are so freakin awesome!!! Have you considered curving the tips outward for a more realistic bow look? OH MY GOODNESS!!! This is so cool. Certainly have to make the Brave style one for the Girlie and this one for the Brothers!!! LOVE your video! This is so totally amazing! We're going to Home Depot right now to check out the supplies to make these for our twin boys. If they turn out well, we're going to use them for an "archery tournament" at our upcoming family cousin carnival. Thank you so much for sharing these awesome instructions!! you are awesome! thank you for posting this, i love you for it! 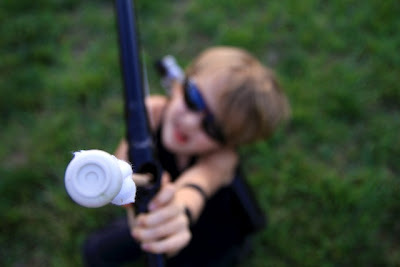 =) my son wants to be hawkeye for halloween, so i will be using your tutorials! thank you thank you thank you! Thanks so much for posting - we have been looking for a Hawkeye costume and cannot find...going to put hubby to work soon! Good luck on the costume! Thanks for the different suggestions! PVC bows are so much fun! THANK YOU SO MUCH! 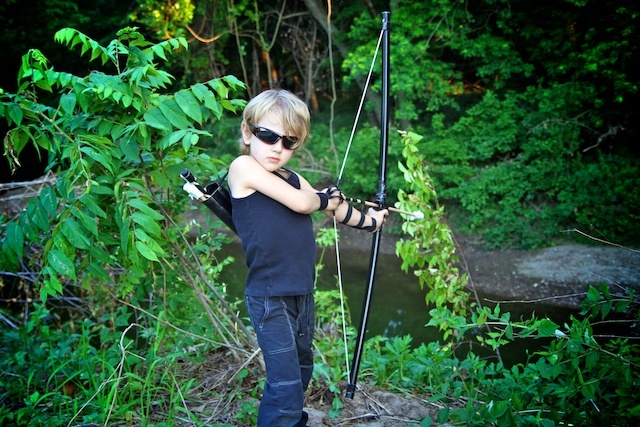 My son is almost 10 and really, really wants to be Hawkeye for Halloween. So far all of the costumes I've managed to find are either JUNK or so expensive that it's sick. Yours gives us such a great starting place (Ryan is already taking archery lessons so he already has the real bow & quiver!) and I am now finally looking forward to Halloween this year. I feel like I can give him his dream costume...and if any kid deserves it this year...it's this one. Also, you originally posted this post on his actual birthday. I see that as a huge sign. Again, thank you. Also, I'm also a blogger who tries to eat as healthy as possible. I saw in my quick glance that you do as well. I would love to talk more with you about working to together as I relaunch my blog. Feel free to check out the blog, www.rumbleinthekitchen.com and contacting me at rumbleinthekitchen@gmail.com. But most importantly, thank you for giving my little boy the costume he's wanted so bad and me a feeling of hope. I've been looking for over a month and tonight I finally found this post. Divine intervention if you ask me. I am so happy you found my post! I am happy to help you out with your son's costume!!! That is great about your blog! I will check it out! Thanks for this idea! We made your costume with a few adjustments. I made a very simple vest, basically a tunic, out of black vinyl fabric and printed a S.H.I.E.LD. badge and glued it on. For the finger guard we used 3 small plastic rubber hair bands and folded strips of fabric over top and hand stitched them in place. Then we attached those to the velcro wristband. We used a mailing tube cut in half for the quiver, which already had a bottom. The bow we made exactly as directed but the arrows were a little different. We used the smallest plastic chair tips we could find and then wrapped black tape around the arrow tips to make the chair tips snug. No glue needed. We also attached thin glow sticks to the arrows so you can shoot them at night. We had so much fun making this. I too have been making PVC based themed bows for kids over the past several months. So far I've given away 3 bows to several 4-5 year olds in my son's preschool class. We originally found his bow at a Pirate Day Event about two months ago in Vallejo, CA. I took the original design and added several dozen improvements that make it shoot better, easier for the kids to pull and increases the overall safety. Right now I have about 6 bows in progress including a Spiderman, Batman, Green Lantern, Wolverine, Shark, Dump Truck/Construction themes....with quite a few more requests from the kids including of course the "Brave" theme from Disney. I don't sell any of them since it takes me about 8 hours to full construct the bow, arrows and quiver (ABS pipe) but I spend most of this time turning them into a piece of art.....so even though it is a bow and arrow it's really a piece of art by time I'm finished fully tricking out their bows. I also order special stickers, buttons and decals that add to the various themes. I have developed a bunch of special techniques too and I've learned many things from watching various YouTube videos....trust me there are some folks out there who are 10x better at this than I am. Here is a list of improvements: 1) first I determine how the PVC or CPVC/Conduit likes to bend...this is important because it helps to get this part right, 2) I use a sort of L or S-curve cut at the ends of the bow for the string and I knot the string in such a away so it comes out of the center of the know as to create less friction against the edge of the pipe...it's very important to smooth any surface that comes in contact with the string...edges will eventually cause it to break. 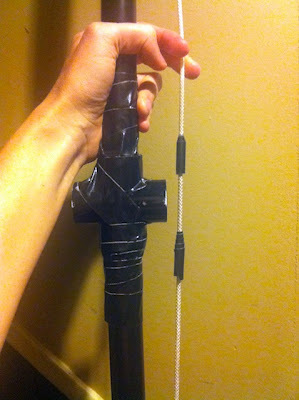 3) I add foam knocks on the string both above and below where the arrow is supposed to go once it is properly stringed. 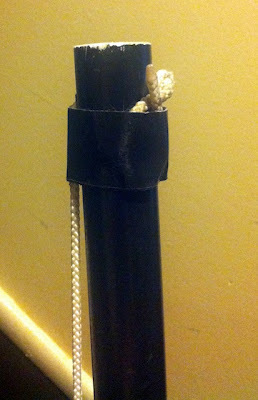 4) I make the handles out of electrical pipe insulation and then wrap with various colors of duct tape. 5) I add an arrow rest above the handle and use a # 2 wood screw into the bow itself. 5) I place a button into the handle so the kids know where to properly hold the bow so they don't get in the away of the veins on the arrows. 6) I spend a great deal of time making certain that the arrows are as safe as possible. I use foam bookmarkers, duct tape and I triple wrap and pack the tips which end up looking like miniature punching bags or cylinder shaped sand bags on the tips of the arrows. 7) I use a very bright fluorescent color for the arrow shafts and tips so that anyone that has an arrow coming at them might have a change of seeing it plus these are soft enough to hopefully prevent anyone from ever getting seriously injured. There a lots of other details around how to glue and construct the arrows, making the quiver, etc. Usually I learn something from each bow that I carry over to the next one and so on. 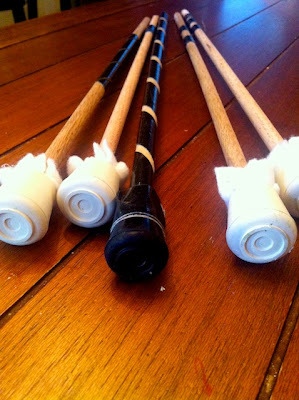 I have some pvc pipes in the Philippines that can be made into a cool bow like this. No Sew Handmade Tea Bags with Personalized Tags!